Our early departure did not happen. It's okay. It's even good that we stayed home an extra day, before driving up the coast, then heading to the Midwest. So, rather than leaving yesterday, we are leaving this morning. I'll let Geoff sleep as late as he needs to, and then we will climb into our vacation-mobile, which is already overloaded packed, and we will head out into traffic onto the open road. We are seeking our destiny. About the only thing I am sure of is that the pets will be well cared for, otherwise we have no game plan. We know which day to be at the airport, and we have a dinner date in the Chicago area. Everything else is a bit sketchy. This could be fun... or something. 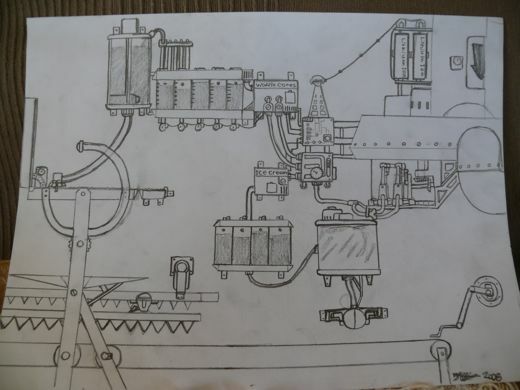 For his Grandpa Corm's memorial, Alex drew an invention. It is in honor of Corm's brief career as a Good Humor Man, selling ice cream, and it is meant to recognize his grandfather's mechanical skills. I really should have Alex do this write-up, so he can explain it properly. Every gear and lever has a purpose, and by the time he describes it, you can't help but believe that this machine actually would make waffle cones and ice-cream and dispense them both, efficiently, and delightfully. Well, I guess I should start turning on some lights, playing some music. No time like the present, when thinking of searching for your destiny. We have short term goals, like finding fresh berries at roadside stands and farmer's markets, we have next week goals, like playing in freshly falling snow. And we have big dreams: Finding a home to call our own, space to make our mark, a somewhere to hope for and focus on. And, of course, we want to enjoy the ride! Have a safe and happy trip! Hopefully you will find some fun along the way!! Good luck with all your goals, enjoy the daily rides. Oh Natalie. I'm so impressed with Alex's skill! The intricacy reminds me of an email that's going around about a musical machine made of John Deere equipment (turns out, it's an animation piece).